Rina Banerjee installing A World Lost in the Sackler Pavilion. Hetty Lipscomb is development writer and stewardship manager at Freer|Sackler. 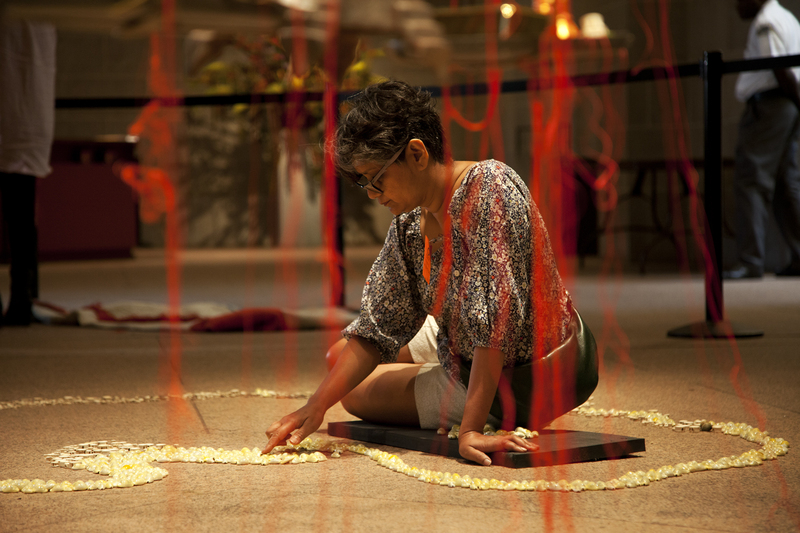 Scientist and artist Rina Banerjee has created a site-specific work in the Sackler Pavilion as part of the Perspectives series of contemporary art, called A World Lost, referencing the major rivers of Asia. Actually, the full title is: A World Lost: after the original island, single land mass fractured, after populations migrated, after pollution revealed itself and as cultural locations once separated merged, after the splitting of Adam and Eve, Shiva and Shakti, of race black and white, of culture East and West, after animals diminished, after the seas’ corals did exterminate, after this and at last imagine all water evaporated…this after Columbus found it we lost it imagine this. It’s a wonderfully organic work, “growing” like a sea creature with tentacles and debris spilling all over the gallery’s stone floor. For Banerjee—and for all of us—the river is a metaphor for life and what we value, and an actual source of survival for many people around the world. An experience with her mother a few years ago spurred Banerjee to think about the importance of water and inspired the sculpture. Her mother wanted to sell some property in Bangladesh, and Banerjee traveled with her from New York to help with the transaction. After they signed various papers in the local magistrate’s office, her mother wanted to to see who was living at the site. Property rights allow for squatters if the land is not occupied; whoever needs it can use it. Detail of plastic cups from Rina Banerjee’s A World Lost. When they arrived, they saw a small house next to a pond. Inside the house, two little girls were digging in the dirt floor to reach the water table. Actually, one was digging, and the other was straining the water through an old cloth to make it drinkable, evidently a daily task. Tradition requires that when a visitor comes to your home, the first thing you do is offer her a glass of water. When one of the little girls spotted Banerjee and her mother, she immediately poured the water into a plastic cup and handed it to them. To be given something so valuable and so hard earned is an honor. 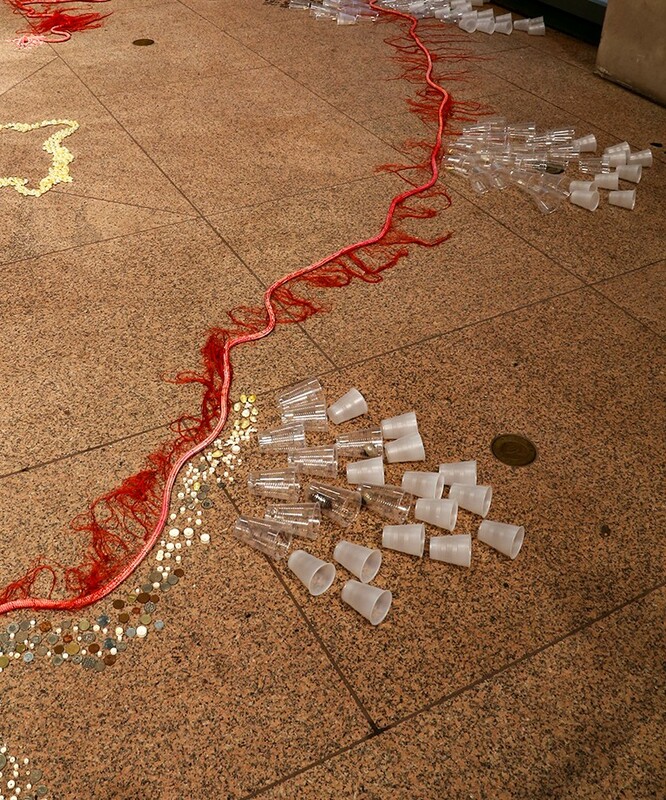 In turn, Banerjee honors the young girls’ generosity and the vital importance of water by incorporating plastic cups in the Sackler installation. Rina Banerjee’s A World Lost will be on view through June 2014. Previous Post Previous Post: Happy Birthday, Jimmy Whistler!